To expedite acquisition, the National Highways Authority of India (NHAI) wants land with environmental issues to be handled separately. "We have conveyed this to the road transport ministry. We go for environment approval for all land we acquire, but land with environment issues requires more approvals," said a senior NHAI official, who did not want to be identified. State administrations are responsible for acquiring land for road projects and this normally takes 18 months. Around 30 per cent of the projects under the National Highways Development Programme are behind schedule on account of tardy land acquisition process. 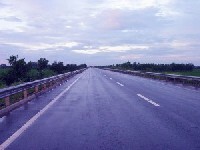 to state governments to acquire all the land needed for a highway project before the Centre put it for bidding. It had said priority would be given to projects where all land had been acquired. To streamline the process, NHAI has set up special land acquisition units under the responsibility of state government officials on deputation to the authority. Ten such units are coming up in Rajasthan, 13 in Bihar, 25 in Uttar Pradesh, seven in Gujarat, 11 in Orissa, 13 in West Bengal, four in Jharkhand, 11 in Maharashtra and five in Assam. Around 40 are operational in Tamil Nadu and Karnataka and sanction has been received for Goa. The ministry has plans to award projects worth Rs 100,000 crore (Rs 1,000 billion), covering 7,300 km, during this financial year.